The little city that I live in is the “berry capital of the world”. Needless to say, I spend most of my summers devouring many pounds of these little gems. I am always looking for new ways to preserve them (other than freezing, canning, or jams) and this year I have embraced my inner mad scientist and began exploring all things fermented. I heard about a process in which you soak blueberries in honey and they culture to form a delicious, syrupy sauce that can be used on pancakes, waffles, ice-creams, cheesecakes, oatmeal, to sweeten tea…or just eaten with a spoon 😉 I just had to try and made what just may be my biggest discovery of the summer. After the 3 day culturing period the berries look almost identical to how they started. You eat one and think, “hmm…blueberries in honey, no big deal”…….but then….you bite into the berry and there is an explosion of fizziness reminiscent of grape pop rocks (in the best way possible). I realize “fermented berries” don’t sound particularly appetizing, but trust me. They are so sweet and a definite conversation starter. You need to try this. 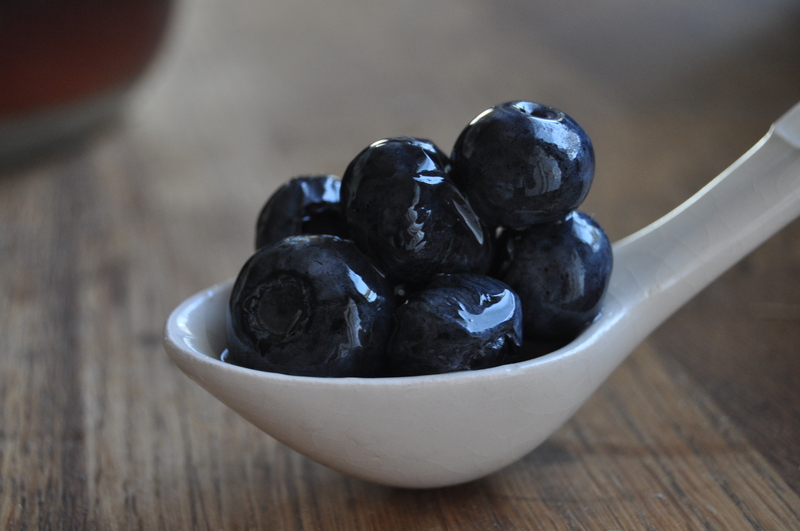 It will works best with blueberries or cranberries as they have a tough enough skin to keep them mostly intact. 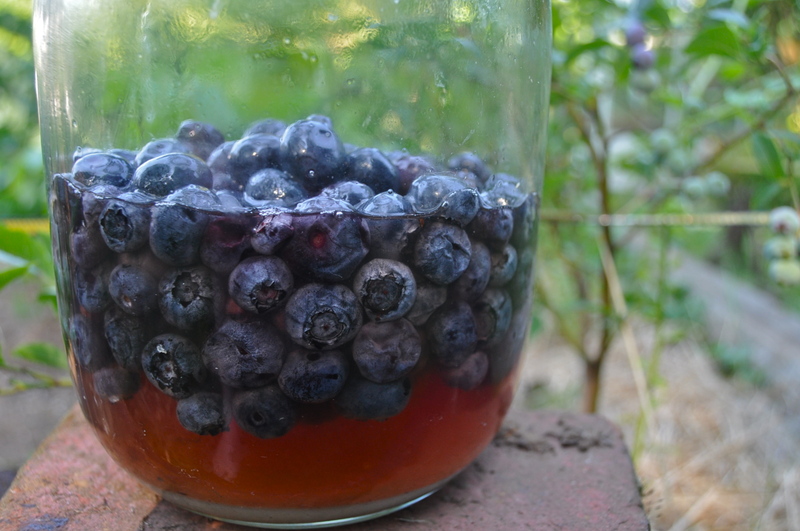 It will work well with other berries, excluding strawberries (they are too acidic to ferment properly), but try and keep some blueberries in the mix. That fizzy little pop you get when biting into them is strangely satisfying. Be sure to use a quality honey for this. It needs to be raw. Poke around your town and try and connect with a local beekeeper, if possible. They will provide you with the highest quality honey often at a better price than the stores charge. I leave mine out for 3 days in the summer (do 5-6 days in the winter) and then move to the fridge to slow the fermentation process. Make as large or as small as a batch as you like. 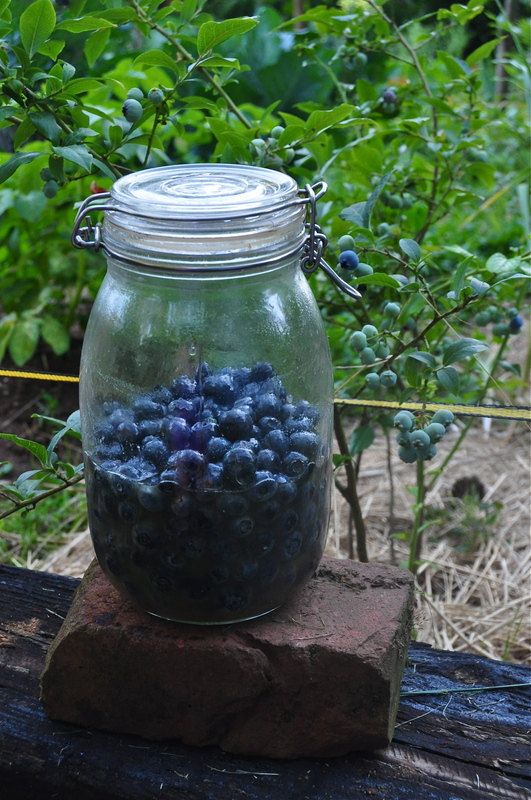 Place blueberries in your jar. Fido jars (like the one in the picture) are the recommended jars of choice for fermenting as they allow gasses to escape. If you use a mason jar make sure to leave a good few inches of head space and screw the lid on loosely (to allow gasses to escape). Pour honey over the berries to cover. Use a spoon to gently stir the berries (taking care not to break them up) to eliminate air pockets. Place in a dark place (a cupboard works great). Once a day, tip your jar to evenly coat the berries. Especially if you are using a mason jar, you may like to “burp” the berries (open the lid to allow excess gasses to escape) once a day. After 3-6 days (see above) move your berries to the fridge where they will continue to ferment, but at a much slower pace. This entry was posted in dessert, raw, vegetarian and tagged blueberries, cultured, fermented, honey, lacto-fermentation, preserved. Bookmark the permalink. These look fabulous! How long do they keep? Oh yum! We visit a blueberry farm every year, and this will be at the top of my what-to-do-with-blueberries list. Thanks. And thanks also for following my blog, which led me to yours. I have done blueberries and loved them! Last night I just started 2 more jars of blueberries and 1 jar of raspberries. Can’t wait for them to be done! I’m going to try these tomorrow. Thanks for the thorough explanation of the type of jar to use and the meaning of burping! You’re welcome! I know you will enjoy them 🙂 Happy fermenting! I wonder if I can use peaches. Can frozen berries be used for this recipe! It sounds amazing! My thought exactly. I will let you know! Trying a test batch right now with frozen berries.